What Do Best Practices In The Robotics Classroom Look Like? The robotics classroom is one of the most dynamic and engaged classrooms in our school. Students have the opportunity to practically implement their problem-solving skills in a variety of different challenges using a variety of different technology which are both based in engineering and robotics but also programming and computer technology. Well-structured projects and open spaces are essential to student success and the opportunity to enable students as problem solvers. Providing students with complex and diverse challenges which challenge them to utilize a variety of tools expand their skills but also motivates them to collaborate and communicate effectively in their groups. Teachers of robotics courses also need to be guides, mentors and have a grasp on the connections they are making in the classroom to translate how these skills relate beyond the classroom. My most recent observation of classroom use of technology using a modified version of the TIM matrix happened in the middle school robotics classroom of Chip Osgood a teacher in the North Reading Middle School. My goal was to identify specific activities or practices that can guide my department and share these as potential growth areas with the group. Since I have come to North Reading I have had the opportunity to view several different robotics classes in the elementary and middle school levels. These classes function in unique ways that alter traditional approaches to instruction. Teachers are often asked to facilitate the students as project managers and embrace an approach that supports a variety of solutions to problems. My observation is framed to identify what environment and context the technology are being used in and the type/level of learning based on the rubric that I see in that classroom. I am then extracting practices that can be identified as high growth for the students and the teachers and connect them to our goals for practice. At the Infusion level, a range of different technology tools is integrated flexibly and seamlessly into teaching and learning. Technology is available in sufficient quantities to meet the needs of all students. Students are able to make informed decisions about when and how to use different tools. The instructional focus is on student learning and not on the technology tools themselves (Technology Integration Matrix). In Chip’s classroom students are engaged in a variety of challenges with the Lego EV3 robots. Students are organized into a variety of roles as part of a team and use the web-based documents to document their process and team progress. Students continually document their process and troubleshooting as a daily progress report. Team members share a variety of roles in which they identitfy the necessary skills these roles require and can develop action lists on their experience. The Authentic attribute involves using technology to link learning activities to the world beyond the instructional setting. This characteristic focuses on the extent to which technology is used to place learning into a meaningful context, increase its relevance to the learner, and tap into students' intrinsic motivation (Technology Integration Matrix). Students move in between the large “table tennis” table which contains a maze and their desktop computers in which they test short scripts for programming the robots. As they transition they are communicating about their process and roles on completing the tasks. Each tool either creates, documents, responds to programs or enables programming. Students respond to these tools and utilize them for completion of the challenge. Productivity Tools, Spreadsheet Tools, Web 2.0 & 3.0 Tools, Word Processing Tools, Simulation, Internet Resources, Drawing Tools, Lego EV3 Robots, Programming Software. In this lesson students is the focus of engaged self-directed problem solving. The tools in the lesson support the learning as a way to catalog and capture their process and encourages them to continue to ask questions and troubleshoot. It is clear the students have a deep level of buy into the result from the conversations they can be heard having like "Did you code it that way?" or "Lets try it this way". Students in this environment are engaged in their process and use the tools support that problem-solving process. Students are forced to adapt to the environment and learn and grow in new ways. This can sometimes be challenging to a student who loses focus or direction easily but in most groups he can lean on the support of his team/ classmates. Groups are balanced and mindfully formed. They work well together and all were engaged in the content. Teams are able to strategize, communicate and problem-solve effectively while actively moving in the room. 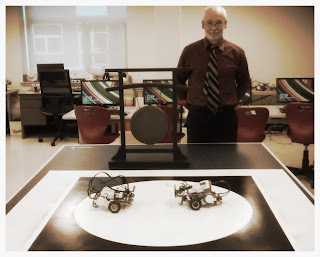 Students are actively encouraged to move and problem-solve, program and test the robots. This movement defines the motivation and strategies executed by the teacher to create the environment. Students are responding to roles designed by the teacher which activate authentic learning such as the "Project Manager" or "Information Specialist". Students are encouraged to be self-directed. Where one student lets up another picks up the necessary roles in the project. Shared responsibility was evident and encouraged. Clearly defined areas for reflection and student process collection. Students can clearly see the benefits of cataloging their process and learning from their mistakes or success. Students recognized their problem solving was enhanced by understanding their process. Student attention is based on a result of using the technology appropriately to attain a result as opposed to using the technology as the result itself. The technology tools support the process of evaluating their results. During the “Hour Of Code” week of December 7th-11th over 500 students in the North Reading Middle School and High School and all students in the 3 elementary schools participated in a variety programming and coding activities. The Hour of Code is a Global event promoted by the Code.org organization which introduces students to programmatic thinking and a stronger understanding of the benefits of learning computer science concepts. A focus is placed on showing students how problem solving and coding skills are not as mysterious a one might think and having a basic understanding of computer science concepts will be essential to their future. The goal for the North Reading Digital Learning Department was to expand the event outside of single classrooms and offer the event as a school wide event in the MS and HS in which teachers could participate by bringing their classes to the new Distance Learning Lab and Media Center to experience the activities. The event was met with great support as all Middle School students participated and 3 full days of High School classes participated as well. With the help of Shereen Tyrrell, Executive Director Of MassTLC (Massachusetts Technology Education Leadership Council Education Foundation) and also a North Reading resident, great professionals from the world of software development and engineering were recruited to speak with the students about their experiences in their careers and share their work and educational experience. These professionals included Jeff Delaney, VP of Engineering at Ericsson, Adity Dokania, Software Engineer at Kensho Technologies and David Kelley, Software Engineer at Amazon Robotics. Each of these professionals captivated the students and brought to light the meaning behind their participation and how these skills can be an important part of their future. The benefit of implementing the “Hour Of Code” at this level is the increased exposure that the students get to recognizing that the world of programming and software development can be for everyone. Students see how coding and programming plays a part in their everyday life and can be a great field to consider for a career. The speakers enhance the “Hour Of Code” experience by encouraging students to try the activities and provide the authentic presence of a “professional” in the classroom. Expanding our participation shows that we value these skills in our schools. When students are urged to think about their future we provide them with an inspiration that fuels them to think outside of the box and encourages them to develop a vision for their future. The “Hour Of Code” supports the vision for enhancing curriculum offerings related to computer science and web development and helps students see the big picture of their education. Skills: What specific skills does the student acquire?